As part of the Pilot for a Day program, Kylee Vidas spent an action-packed day at the Youngstown Air Reserve Station, suiting up in a genuine aircrew flight suit and taking the official oath of office. On any given day, you can find pint-sized soldiers walking the halls of Akron Children’s Hospital – children who are fighting chronic and life-threatening diseases. Last month the Youngstown Air Reserve Station stood up and saluted one of our brave patients, 9-year-old Kylee Vidas, through the 910th Airlift Wing Pilot for a Day program. For more than a decade, the Pilot for a Day program has been rolling out the red carpet for our patients like Kylee in the Mahoning Valley. Nominated by their physician, patients between the ages of 8-14 years who have a chronic, debilitating or life-threatening illness are selected to participate in the program four times a year. The program is coordinated through the Community Outreach, Education and Support Center of Akron Children’s Hospital Mahoning Valley. 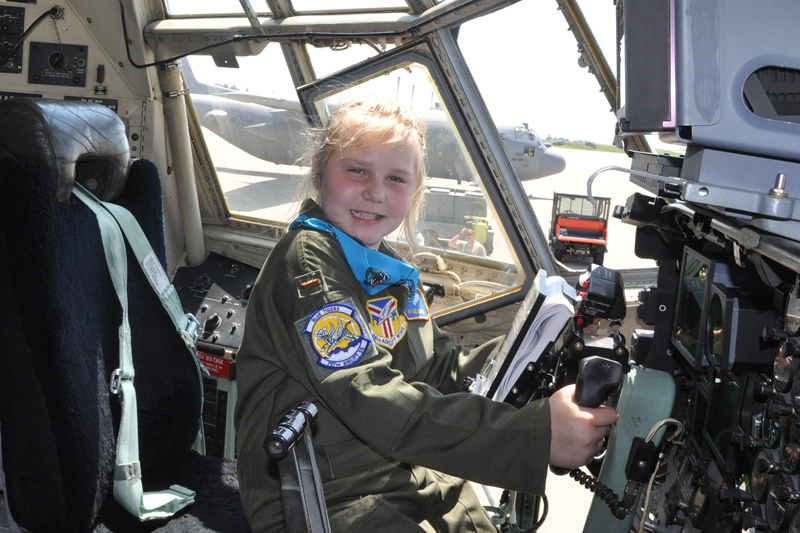 Kylee, a Type 1 diabetes patient from Warren, Ohio, was the 53rd patient to be sworn in as an honorary second lieutenant in the Air Force. As part of the program, the young honoree got a behind-the-scenes tour of the base including a visit to the Life Repair Support shop, the operations building, and had the opportunity to use the Fire Arms Training Simulator. Kylee also made a visit to the base’s fire station, hitched a ride on the fire truck and saw a live demonstration of the equipment. The day was topped off by sitting in the cockpit of a C-130 Hercules transport aircraft and taxi down the runway at nearly 80 mph before returning to the base.